We're proud to be the DofE Award's largest participant. If you're 14 or over, then you can begin - just ask the instructors in your squadron and they'll help you get started. For more information now on everything DofE, follow any of the links on this page to visit their official website. 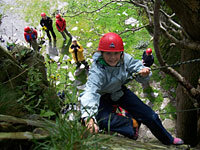 There are three levels which, when successfully completed, lead to a Bronze, Silver or Gold DofE Award. And it's never too late to get in on the action - depending on your age you may be able to jump straight in at Silver or Gold level! For more information visit http://www.dofe.org/.